Wrongful Death Legal Information - Giometti & Mereness, P.C. Wrongful death claims did not exist under the English common law, which forms the basis of the law in most U.S. jurisdictions. However, in the 19th century, statutes were enacted in both Britain and the U.S. to permit recovery of damages for death caused by the wrongful act of another. Colorado’s Wrongful Death Act, which was enacted toward the end of the 19th Century, has been often amended by the General Assembly. The Wrongful Death Act now includes six statutes, C.R.S. §§ 13-21-201, -202, -203, -203.5, 203.7 and -204. Because the Wrongful Death Act is a creature of statute, Colorado courts have narrowly construed it, i.e., the courts have not judicially expanded the rights and remedies under the Wrongful Death Act, but have indicated that it is the General Assembly’s job to do so. For instance, historically, the courts construed the Wrongful Death Act to mean that a plaintiff in a wrongful death action could not recover damages for grief and sorrow resulting from the loss of a loved one. However, such non-economic damages for grief, sorrow, and loss of companionship have been allowed since the General Assembly amended C.R.S. § 13-21-203 in 1989. In Colorado, a general right of action exists under C.R.S. § 13-21-202 to recover damages caused by “the wrongful act, neglect, or default of another . . . .” The plaintiff is allowed to recover if the wrongful act or neglect is “such as would, if death had not ensued, have entitled the party injured to maintain an action and recover damages in respect thereof . . . .” This means, generally, that any legal defenses that would have operated to bar or reduce the claim of the injured party, if he or she had lived, also operate to bar or reduce the claim of the plaintiff or plaintiffs in a wrongful death action. The statute governing what damages are recoverable in a wrongful death action is C.R.S. § 13-21-203(1). It states, in part, that “[a]ll damages accruing under section 13-21-202 shall be sued for and recovered by the same parties and in the same manner as provided in section 13-21-201 . . . .” Therefore, § 13-21-201 governs who can bring a wrongful death action to recover damages under § 13-21-202. Section 13-21-201 establishes rules of priority for bringing a wrongful death action. Since the main purpose of a wrongful death action is to provide an avenue of recovery for the persons who were economically dependent upon the deceased, the rules of priority are geared toward this end. Thus, under § 13-21-201(1)(a), the spouse of the deceased has the exclusive right to commence a wrongful death action during the first year after death. By written election of the spouse, he or she may allow the heirs of the deceased to join in the wrongful death action during the first year. Of course, if there is no spouse, the deceased’s heirs may bring a wrongful death action immediately. Pursuant to § 13-21-201(1)(b)(I), during the second year after death, the spouse and heirs of the deceased have equal standing to bring an action for wrongful death. If the heirs bring an action, the spouse is permitted to join in the action by filing a motion within 90 days after he or she receives written notice of its commencement. The term “heir” has a different meaning under the Wrongful Death Act than under the rules of intestate succession contained in the Uniform Probate Code, C.R.S. § 15-11-101 et seq. Under the Uniform Probate Code an “heir” may include collateral relatives such as siblings, aunts, uncles or cousins of the deceased. However, under the Wrongful Death Act, Colorado courts have interpreted the term “heir” to include only a child or lineal descendant of the deceased. Thus, the courts have held that a sibling of the deceased has no standing to bring a wrongful death action. Pursuant to § 13-21-201(1)( c), parents of the deceased have a right to bring a wrongful death action if the deceased is an unmarried minor without descendants or an unmarried adult without descendants. Thus, if the deceased is married, or has any descendants, parents do not have standing to bring a wrongful death action. Generally, parents have an equal right to share in the proceeds of a wrongful death action. However, if the parents are divorced, separated or living apart, either may file a motion asking the court to fairly apportion the proceeds of the action. In resolving a wrongful death case, it is important that the claims of all parties with potential standing to sue be resolved. Troublesome issues can arise where only one parent pursues a wrongful death claim, leaving the second parent with a potential, unresolved claim, or if a purported common law spouse attempts to bring a wrongful death action and tries to take precedence over the deceased’s heirs. In Colorado, as in other jurisdictions, courts recognize that the parents of an infant who dies as a result of injuries sustained as a fetus have standing to pursue a wrongful death action for the child’s death. In such a situation, the mother’s claim for her own bodily injury is separate and distinct from the parents’ claim for the wrongful death of their child. For instance, if an employer’s negligence results in injury to both the mother and the fetus, the mother’s bodily injury claim may be barred by the exclusive remedy provisions of the Workers’ Compensation Act. However, since the injuries to the unborn child do not derive from the mother’s injuries, but are separate and distinct, the parents’ wrongful death claim is not barred by the Act. Colorado courts have also recognized that parents may be able to pursue a claim for the wrongful death of a fetus. Such a claim may involve highly complex medical issues. Whether a claim for the death of a fetus may be brought depends on the medical issue of whether the fetus was “viable” at the time the fetus died. The U.S. Supreme Court has indicated that a legislature or a court may not arbitrarily establish the moment in the gestation period when a fetus is viable, since viability is a medical concept. Therefore, when parents bring a wrongful death action for the death of a fetus, they must present medical evidence to establish the fact that the fetus was viable at the time the fetus was killed by the wrongful actions of the defendant. Section 13-21-203, C.R.S., contains several limitations on the damages recoverable in a wrongful death action. One of the main limitations is contained in the middle of subsection (1), where the statute states that there shall only be one civil action for the wrongful death of any one decedent. What this means is that multiple or serial wrongful death actions cannot be brought for the death of any one decedent. Rather, all claims against all defendants who are potentially liable for the decedent’s death must be brought in the same action. Failure to abide by this “one action rule” will likely result in the dismissal of the second action. This “one action rule” is a pitfall that may trap the unwary. In cases where the decedent dies with a spouse or heirs, the plaintiffs in a wrongful death action may recover economic damages, without any limitation, and non-economic damages for grief, sorrow and loss of companionship, currently subject to a limitation of $436,0705. Economic damages are determined by the “net pecuniary loss” rule. For instance, if the husband, who is a family breadwinner, dies, the plaintiff or plaintiffs may recover as economic damages the amount of the husband’s past and future earnings, less any amount the husband would have consumed for his own support. Thus, in a wrongful death action predicated upon the death of a spouse who had a high earning capacity, economic damages are often measured in seven figures. On the other hand, if the deceased dies without a spouse or heirs, or without dependent parents, the total amount of damages, both economic and non-economic, recoverable under § 13-21-203(1), is currently limited to $436,0706. Section 13-21-203(1) contains an exception to these limitations on recoverable damages. The statute lifts these limitations if the decedent died as a result of a “felonious killing”. A felonious killing is one which rises to the level of first or second degree murder or manslaughter. However, an actual criminal conviction of the defendant is not necessary. Even in the absence of the defendant’s criminal conviction for one of these offenses, the court in the wrongful death action may make an independent determination as to whether the conduct of the defendant was sufficiently egregious as to constitute murder or manslaughter. A claim for felonious killing might be presented, for instance, in a situation where an at-fault driver was highly intoxicated by alcohol or drugs and was engaging in reckless driving behavior. Although historically recovery of punitive damages was not permitted in wrongful death cases, the General Assembly’s amendment of § 13-21-203 in 2000 now allows recovery of such damages. A claim for punitive damages may arise if the defendant’s conduct was willful and wanton, beyond a reasonable doubt. A claim for punitive damages may not be presented in the plaintiff’s original complaint, but only later in the case if the evidence establishes a prima facie claim for punitive damages. If the deceased survived for a period of time before dying as a result of the injuries caused by the wrongful act of the defendant, then the deceased’s personal representative may pursue a claim under the Survival Statue, C.R.S. § 13-20-101, to recover economic damages incurred by the deceased between the time of his or her injury and the time of death. Damages in an action under the Survival Statute are limited to economic losses incurred before the deceased’s death. Damages for the deceased’s pain and suffering are not recoverable, nor are prospective economic losses. Nevertheless, damages recoverable in a survival action may be significant, particularly if the deceased was hospitalized for a long period of time before expiring. Often in these situations, subrogation claims of hospitals, medical insurers or Medicare must be taken into consideration before a claim under the Survival Statute may be resolved. It is important to understand that an action under the Survival Statute is separate and distinct from a claim for the deceased’s wrongful death. A wrongful death action is commenced by one of the parties with standing to sue under C.R.S. § 13-21-201 – the spouse, heirs, or parents of the deceased. On the other hand, a survival action may only be brought by the deceased’s personal representative. In cases involving married couples, the spouse is often appointed as personal representative, but this is not always the case. In any case where the deceased survived for a period of time after being injured, the potential for a claim under the Survival Statute should always be taken into account. If no personal representative has been appointed, 45 days after the deceased’s death, a creditor of the deceased, such as a health insurer, may petition to have a personal representative appointed so that a claim for the deceased’s medical expenses may be pursued. Q. If there is more than one plaintiff who is bringing an action for the death of a loved one, such as a situation where the action is brought by both the spouse and heirs or multiple heirs, do the limitations on damages apply separately to each plaintiff? A. The Wrongful Death Act, § 13-21-203(1), provides that there shall only be one civil action for the wrongful death of any one decedent. Thus, the limitations on damages contained in § 13-21-203(1) apply per decedent, regardless of how many plaintiffs are bringing the action. In other words, simply because there may be three plaintiffs pursuing an action for the death of a loved one, each plaintiff is not separately entitled to recover the statutory cap on non-economic damages. Q. If a person dies as a result of the wrongful act of another, but the deceased is not survived by a spouse, children or parents, may a brother or sister of the deceased bring a wrongful death action as the deceased’s “heir”? A. Colorado courts addressing this issue have held that siblings of the deceased do not have standing to bring a wrongful death action. Even though a sibling may be an “heir” under the Uniform Probate Code, courts construing the Wrongful Death Act have held that the term “heir” under the Act means only the lineal descendants of the deceased. Thus, if the deceased is survived only by siblings, or other collateral relatives, no one has standing to pursue a wrongful death claim. Q. What statute of limitations applies to wrongful death claims? Are there particular statutes of limitation that apply if both the deceased and the at-fault party die in the same event, such as a motor vehicle accident or a plane crash? A. The statutes of limitations pertaining to Wrongful Death Actions in Colorado are contained in C.R.S. §§ 13-21-204, 13-80-102(1)(d) and 13-80-108(2). These statutes provide that a cause of action for wrongful death accrues on the date of death and must be brought within two years of the time the cause of action accrues. Thus, a wrongful death action must be brought within two years of the date of death. However, if the at-fault party also died in accident or event causing the deceased’s death, then the non-claim provisions of the Uniform Probate Code, C.R.S. § 15-12-803, must also be taken into consideration. These non-claim provisions are shorter than the general two year statute of limitation, and different non-claim provisions apply depending upon whether the wrongful death claim arose before the at-fault party’s death or at or after the at-fault party’s death. Failure to comply with these non-claim provisions may result in the wrongful death claim being barred, except to the extent that liability insurance proceeds are available to satisfy the claim. Q. What is a solatium claim? How do the comparative negligence rules apply to solatium claims? A. The General Assembly modified the Wrongful Death Act in 1996 by adding C.R.S. § 13-21-203.5, which initially provided that the parties entitled to sue in a wrongful death action may make a written election to recover a solatium amount of $50,000, in lieu of recovering non-economic damages. Pursuant to C.R.S. § 13-21-203.7, this solatium amount was adjusted upward for inflation to $68,250 on January 1, 1998, and will be adjusted upward again on January 1, 2008. If the solatium amount is elected, the plaintiffs do not have to put on evidence of grief, sorrow or loss of companionship in order to recover the solatium amount. The solatium amount is recoverable once the liability of the defendant is established. Furthermore, since recovery of the solatium amount is automatic once the defendant’s liability has been proved, the solatium amount is not subject to reduction by the comparative negligence or pro rata liability statutes, C.R.S. §§13-21-111 and 13-21-111.5. For instance, if the deceased was 30% at fault in causing his or her own death, the plaintiff is still entitled to recover the entire solatium amount. Of course, except in product liability cases, if the deceased was 50% or more at fault, the defendant would not be liable, and the plaintiff’s entire claim for wrongful death would fail8. 1See G. Giometti, Colorado Handbook of Wrongful Death Law (2d Ed. 2010), Chapter 1 and Chapter 2, § 2.1 & 2.2. 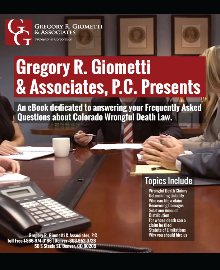 2See G. Giometti, Colorado Handbook of Wrongful Death Law (2d Ed. 2010), Chapter 2, §§ 2.3 & 2.4 and Chapter 5. 3See G. Giometti, Colorado Handbook of Wrongful Death Law (2d Ed. 2010), Chapter 4. 4See G. Giometti, Colorado Handbook of Wrongful Death Law (2d 2010), § 2.5 and Chapter 11. 5Because of some ambiguity in the statute, this amount may be $486,010, the limitation for non-economic damages recoverable under § 13-21-102.5. C.R.S. § 13-21-203.7, which was amended in 2007, provides for an inflationary adjustment of these amounts effective January 1, 2008 to $436,070. 7See G. Giometti, Colorado Handbook of Wrongful Death Law (2d 2010), § 2.8. 8See G. Giometti, Colorado Handbook of Wrongful Death Law (2d Ed. 2010), §§ 2.6 and 11.5.